Open 24/7! You will always find a Hotel Team Member on duty to assist you with anything you need. Saskatoon's NEWEST hotel, adjacent to the Credit Union Centre. 84 oversized guestrooms with free wifi, fridge, microwave. Pool, hot-tub, fitness centre, business centre. Includes free hot breakfast. Welcome to Comfort Suites Saskatoon! Just steps from the SaskTel Centre in North Saskatoon, discover a world-class service-focused hotel experience that will complement any travel style. Whether you're in town for business or leisure, the 84 stylish suites at the Comfort Suites Saskatoon are an unforgettable escape, enhanced with attentive services and top-notch amenities that make our hotel a step above the rest. Steps from the SaskTel Centre, world-class comfort awaits you at our all-suite Saskatoon hotel. Saskatoon Airport Hotel near the SaskTel Centre - Guests of the Comfort Suites Saskatoon will discover a newly built North Saskatoon hotel that is convenient to Saskatoon's major attractions, but away from the bustle of downtown Saskatoon. 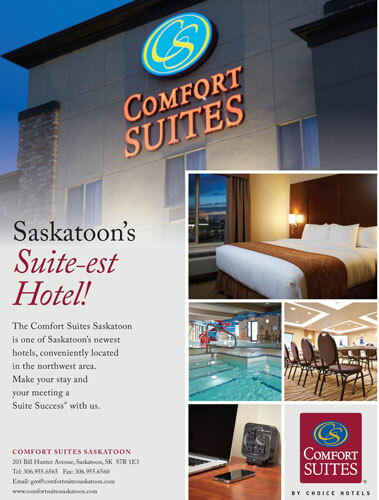 The Comfort Suites Saskatoon is adjacent to the SaskTel Centre, and close to the John G. Diefenbaker International Airport. Discover the Saskatoon Blades Hockey Club, Mendel Art Gallery, Auto Clearing Motor Speedway, and the Saskatoon Museum conveniently at your fingertips. Inviting Hotel Suites - Experience world-class comfort and impeccable style at our all-suite Saskatoon hotel. Our 84 stylish and well-appointed suites are designed with your convenience in mind, and are enhanced with a host of modern features that make us a step above the rest, from the plush pillow top beds and complimentary internet to our cozy rooms. Marquis Drive exit off of Hwy 16.